After several delays and months of localization time, Persona 5 is finally in the hands of gamers. The game turned out pretty great (check out our review if you’re still on the fence), and early sales figures show it’s a success for Atlus. That isn’t a huge surprise, as the Persona series has been one of the niche publisher’s most popular series for a while now, but it does mean that Atlus will likely go ahead with its plan of creating all kinds of tie-in games like they hinted in a recent customer survey. The last game in the series, 2008’s Persona 4, saw a wide array of spin-off titles. From 2D fighting games to a rhythm game, Atlus didn’t mind taking putting its cast of beloved characters in a wildly different setting. That’ll likely be the case for Persona 5 as well, so we came up with a list of Persona 5 spin-offs we’d like to see made. Please note that there are extremely minor story spoilers (nothing huge like the main antagonist’s identity or anything) in the list, that hints at some slight character development in the game. 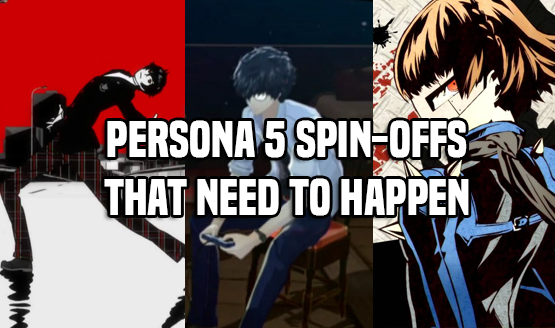 With that warning out of the way, check out our list below of 10 Persona 5 spin-offs that need to happen! We hope you enjoyed our look at 10 Persona 5 spin-offs that need to happen. While it’s unlikely that every single one of these titles will be made, it wouldn’t be shocking to see some of the hypothetical titles on the list materialize. Persona will continue to be a huge foundation for Atlus as a publisher, and 5‘s cast is strong enough to support all types of new adventures. Let us know in the comments below which Persona 5 spin-offs you’d like to see made, and how you are enjoying the latest RPG from Atlus!